Louis Comfort Tiffany (1848-1933) was one of America’s most acclaimed artists and is most associated with the Art Nouveau and Aesthetic movements according to Wikipedia. He focused in the decorative arts and is best known for his work in stained glass. He was the son of Charles Lewis Tiffany (1812-1902), founder of Tiffany & Company. Lewis chose to pursue his own artistic interests rather than joining the family business. He began his career as a painter and traveled extensively through Europe. In the late 1870s, Tiffany turned his attention to decorative arts and interiors. In 1881, he did the interior design of the Mark Twain House in Hartford Connecticut. His most notable work was in 1862 when President Chester Arthur refused to move into the White House until it had been resorted, according to Wikipedia. He commissioned Tiffany, who had begun to make a name for himself for interior design work, to redo the state rooms. Tiffany worked on the East Room, Blue Room, Red Room, the State Dining Room, and the Entrance Hall. At its peak, his factory employed over 300 artisans. He was appointed as art director at Tiffany & Company upon his father’s death in 1902. Tiffany lived during the Gilded Age, a period of rapid church expansion; one source reports that there were 4,000 churches under contraction in the U.S. in the 1880s according to a recent The New York Times article on an exhibit of Tiffany’s ecclesiastical work. There was a great demand for artists that could create great and inspiring stained glass windows, mosaics, rederos, and altars. Many churches turned to Tiffany to create such beautiful works. His work in New York churches include Saint Michaels, Advent Lutheran, Saint Ignatius Loyola, Temple Emmanu-El, Church of the Incarnation, Holy Trinity Lutheran Church, Eldridge Street Synagogue; in New Jersey, numerous windows are in Second Reformed Church of Hackensack. 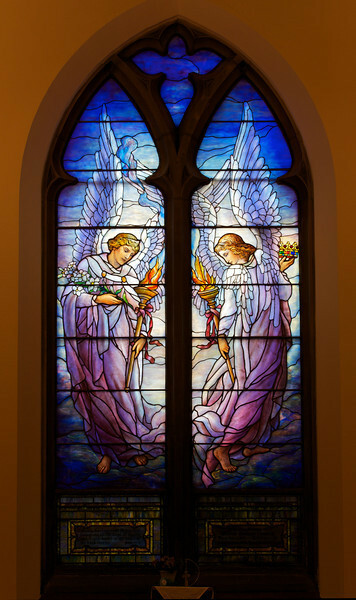 After fire destroyed their first church, The Second Reform Church in Hackensack, New Jersey contacted Tiffany requesting windows depicting events in the life of Christ and contracted Tiffany Studios for five windows, according to the church website. The church also contracted Duffner & Kimberly Co. for one window. The installation of these windows was competed before the dedication ceremony in 1909.